SoundTaste Audio Converter is designed for converting audio files to the most popular audio formats directly and on-the-fly (without temporary files produced). It is a powerful audio converter that enables you to convert audio files of almost any formats, including WMA, MP3, MP2, MPGA, WAV, OGG, CDA, VOX, RAW, G721, G723, G726, MPC, AIF, AIFF, etc. to the most popular audio formats MP3/WAV/WMA/OGG to play on your music player with no quality loss! SoundTaste Audio Converter also works as an audio joiner. You can use it to easily combine, join or merge multiple music files to a larger file as MP3, WAV, WMA or OGG format in seconds for non-stop playback. Convert your beloved audio music from one format to another win three easy steps now! 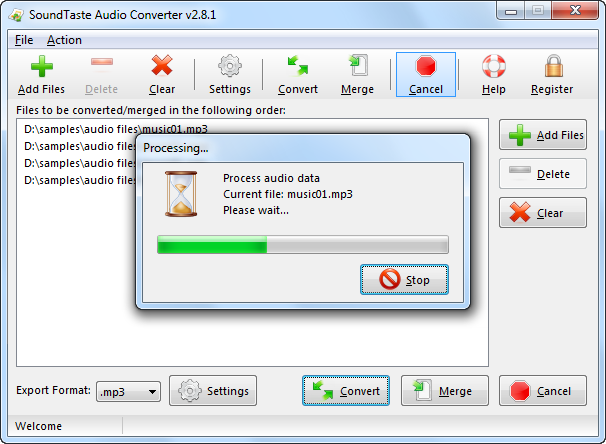 This audio converter converts sound files with speed and also works as an audio joiner. Converting audio files of various formats is no longer a hassle.